After defeating the Fort McMurray Giants 12-7 on Sunday afternoon the Edmonton Prospects finished their regular season with a .500 record for a second consecutive year. The question now becomes can the Edmonton Prospects make their third consecutive WMBL finals and attain their preseason goal of “winning the last game of the summer”? Another regular season complete – official attendance increase of 25% compared to last year. The numbers just keep growing. Thank you Edmonton for the support! Prior to the beginning of this season, Roberto Alomar of the Toronto Blue Jays wrote a letter to Mayor Don Iveson fighting to keep RE/MAX Field as a part of any and all downtown plans. The reaction on Twitter supporting the Prospects and RE/MAX Field was recognized by Mayor Iveson. The Mayor re-affirmed his desire to keep a ballpark in Edmonton but mentioned he would like to see more support in the stands. Thank you Edmonton! The first look at the official numbers according to a tweet by “Director, Partnerships and Ticket Sales” Ryan Jagoe shows a 25% increase in attendance. The Prospects jumped out to a 6-0 lead in the first inning of their final game. Eric Crain with a RBI single opened the scoring. A 2-RBI triple by Beaux Guilbeau made it 3-0. Daylen Calicdan, Anthony Cusati and Tony Olson all added RBI singles to round out the opening frame scoring. Prospects starting pitcher Brenden Wiun pitched five innings on the afternoon. After a quiet first inning, the Giants were able to put up three runs in the second. After 1-2-3 innings in the 3rd & 4th, Wiun lost the plate in the 5th. The Giants capitalized adding 4 runs but Wiun still left the game with the lead and collected the win. Calicdan drove in his second run of the season in the bottom of the 2nd with a double. 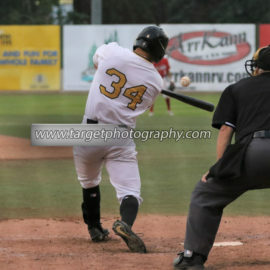 In the bottom of the 3rd Zane Takhar hit into a double-play but still earned a RBI as AJ Nitzschke crossed the plate. A Michael Gahan double drove in Matt Brisson for the Prospects 9th run of the game. With the score 9-7 in favour of the Prospects, the offence ostensibly salted the game away with three more runs in the 6th inning. Guilbeau and Calicdan led the inning off with back-to-back walks. Nitzschke singled in a run then Matt Brisson picked up his first 2 RBI of the season with a single of this own. The last season turnaround for Scott Gillespie continues! Gillespie pitched the 6th through 8th innings for the Prospects allowing only 1 hit and issuing 2 walks. Jordan Smith pitched a shutout 9th inning for the Prospects making it three straight appearances without allowing a run.